The Importance of developing players own individual strengths. This is one for the coaches! Here is an insight to what we believe is important while coaching young female footballers. Girls Footy Australia is excited to announce and welcome our newest AFLW coach, Izzy Huntington. Izzy was the #1 draft pick for the 2018 AFLW season to the Westerbulldogs. Izzy had an incredible start to the AFLW 2018 season and had a huge influence on the Bulldogs. Unfortunately due to a ACL injury her playing season was cut short but her positivity and team first nature shone bright, helping with the Doggies success. Prior to being drafted Izzy has represented Victoria Metro for 4 yeas and participate in the first ever AFL Youth Girls Academy in 2017. In addition, Izzy was a part of Sandringham Dragons TAC Youth Girls team for 5 years and represented the South Metro Junior multiple times. Izzy's experience at an representative and elite level brings a wealth of knowledge to our AFLW coaching team. Izzy's positive energy and attitude plays huge role in her success as a coach, motiving and encouraging her players to be their best and of course enjoy their football. We are looking forward to Izzy's involvement in Girls Footy Australia, kicking off coaching Wednesday's nights of Melbourne Girls Grammar Fudmental Skill program with old Vic Metro team mates Katherine Smith from the Melbourne Football Club and Britt Boicici from the Collinngwood Football Club. As part of our latest initiative, Girls Footy Australia will be releasing free educational resources on how to improve key Football fundamentals and skills. These resources are designed to help any footballer on their journey. The recourses have tips from our head coach and co founder from the Melbourne Football Club Katherine Smith and contain key points on performing fundamentals of football. Each resource clearly describe how to perform the fundamental skill with correct and safe technique. 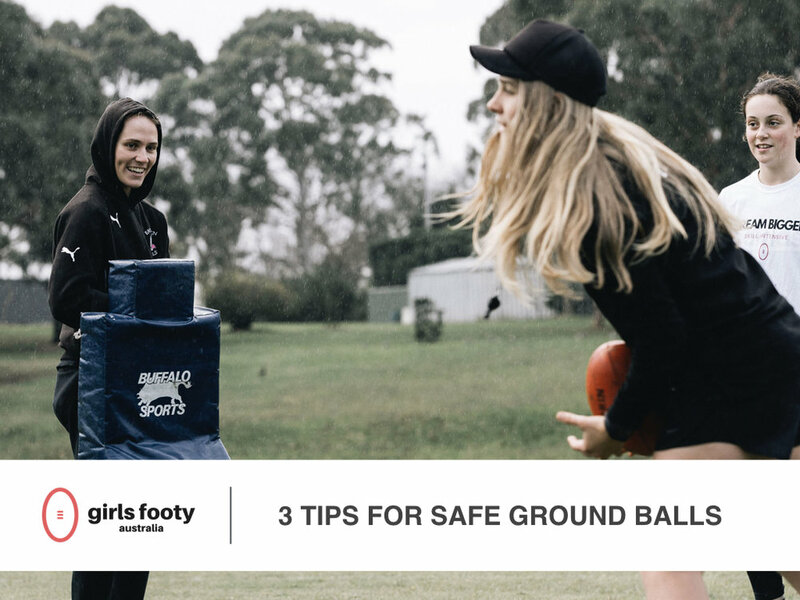 To access the free learning rescues follow the link below, enter your details and receive an email with the first recourse "3 tips to approaching ground balls". Keep your eyes pealed for more free learning resources to come. 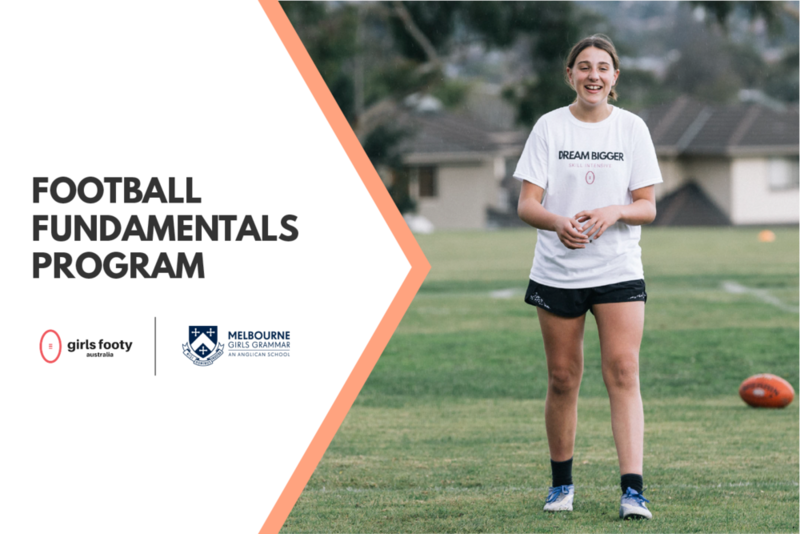 Girls Footy Australia is excited to announce that we will be running an 8 week fundamental football skill program for Melbourne Girls Grammar. The program will include 25, year 5 & 6 students from Melbourne Girls Grammar, participating in 45 minutes of football twice a week. The program is based on three key aspects; fundamentals, fun, and fitness. The fundamental skills that we will focus on include kicking, hand balling, marking, ground balls, tackling and spoiling. Our aim is to teach these fundamentals so that each athlete feels comfortable and confident performing these skills under pressure and with a safe and effective technique. We are excited to bring an abundance of energy and fun during the program, starting with our passionate AFLW coaches and fun competitive games during each session. Our fantastic AFLW coaches will include Girls Footy Australia head coach from the Melbourne Football Club Katherine Smith, Melbourne Football Club Midfielder, Sarah Lampard, and Collingwood fan favourite Brit Bonnici. We are looking forward to getting more girls outdoors and active. Football is a terrific way to improve fitness and communication, and our program is structured to include various drills that will support these attributes. Girls Footy Australia is grateful for the opportunity to work with more young female athletes on their football and help develop the future generation of female footballers. What to expect from our coaches in the AFLW 2018 season ? KATHERINE SMITH || Head Coach and Co Founder "Smitty" is a key defender for the Melbourne Football Club, playing all 7 games in the 2017 season and being nominate for a rising star award in round 7 we are can't wait to see what Smitty brings this season. Except to see Smitty down back again for the Dees, bringing high intensity defensive pressure and using her football experience to create an exciting attack. SARAH LAMPARD || Sarah had a fantastic 2017 season with Melbourne Football Club and has worked extremely hard over the off season to develop her strength. She previously played a key role in the demons defence, often exploding out of the backline with great speed and starting a exciting attack. We expect to see Sarah down back again for the Dees this season, utilising her athleticism, impressive strength and class with the football to bring great flare to the game. PEPA RANDAL || Pepa had an interrupted 2017 season due to an unfortunate injury but we are excited to see Pepa fit and firing to drive the Giants success this season. Except to see Pepa be use her incredible athleticism to her advantage to bring lots of excitement and run off her opponents. Pepa is an outstanding competitor and we expect her to play a key defensive role for the Giants. Want to see our coaches in action ? Head to http://www.afl.com.au/womens/matches to check out the fixture and get down to a game. The Combine was created to give young female footballers an opportunity to better their football and everything that comes with it. We decided to make this event a celebration and reward for some fantastic young footballer from across Victoria. We selected 30 girls who were either the top end of their local club, involved in TAC or selected School Sport Victoria and Under 18 state players to be a part of The Combine. This was also a very exciting day for Girls Footy Australia as it showed the recent partnership with "Base Sports Group" and involvement with “Own Journey” to create a holistic football program for our athletes. They day started off with each athletes receiving a pack including a Lu Lu Lemon singlet and a pair of New Balance runners, the athletes where over the moon and it was a great way to kick off an amazing day. Following this the athletes had a session with Chyloe Kurdas from Own Journey about “The mindset to make it” to inspire our athletes. Chyloe toke the athletes and parents through an interactive session on growth mindset and self-talk, this was a very empowering session for the athletes and provided them with the tools to further develop their passion of football. Up next was the Athletic testing run by Base Sports Group, the athletes tested their 10 and 20m sprint, vertical jump and agility. Each athlete walked away from the testing with a detailed review of their results including averages of the day and information about each test allowing them to learn from their experience and improve. We finished The Combine off with a high intensity football session run by Katherine Smith and Sarah Lampard from the Melbourne Football Club. We heavily focused on kicking at the start of the session, taking the athletes through the basics to improve their techniques and then we put them through their passes with some decision making by foot. The athletes where taught a few new tips and tricks to give them an edge on their competition in ground balls, contested marking, tackling and spoiling.